RTV is a terminal user interface (TUI) for Reddit that allows logging in to your Reddit account, open media using external tools, and much more. The console application is built using Python and the curses library, and runs on Linux and Mac. Use it so your boss can't tell what you're doing, because you do most of your work on the command line anyway, because it's fast and lightweight, or just because it's cool. Easily navigate through the front page, jump to your favorite subreddits, open user pages, browse multi-reddits, search Reddit, etc. 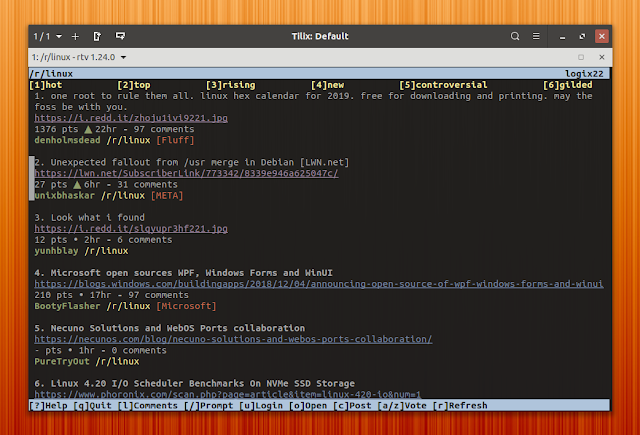 For commenting and creating new posts, Reddit Terminal Viewer uses your default command line editor, be it Nano, Vim, etc. While the application is quite featureful, it's missing a couple of things. One important missing RTV feature is the ability to read and reply to comments. Right now it can only notify you that you have new messages, without displaying any information about this. Another missing feature is that it doesn't respect Reddit tags, so for example spoilers are visible. A RTV demo is available on its project page. 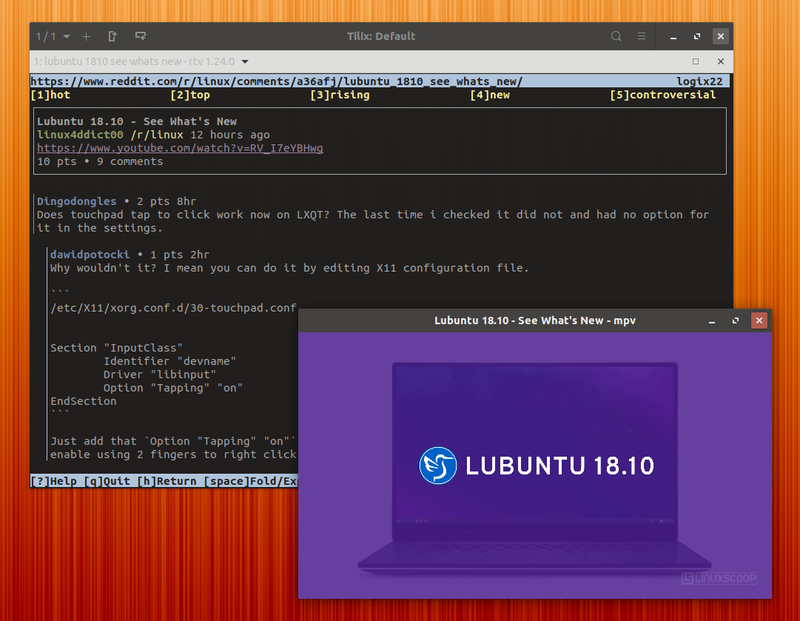 RTV might be available in your Linux distribution repositories so the first thing you should do is perform a search and see if you can install it from there. On the RTV project page you'll find installation instructions for installing it on macOS, Arch Linux, and more, as well as PyPi installation instructions that should work with any Linux distribution. You'll now find a file called rtv.cfg in ~/.config/rtv. Open this file with a text editor and change the settings to suit your needs. In this file you can set the default subreddit, enable RTV to open external links using programs defined in the mailcap config (see below), change the theme or keybindings, and more. This creates a file called .mailcap (hidden file) in your home directory. By default, feh and mpv (so install them if they are not already installed, unless you want to change them) are used to open external media, but you can edit this ~/.mailcap file to change this. Press u to login. Use j / k or ↑ / ↓ to move up and down. Press → to open the selected submission comments, type / followed by subreddit you want to visit to jump to a subreddit, a / z to upvote or downvote. 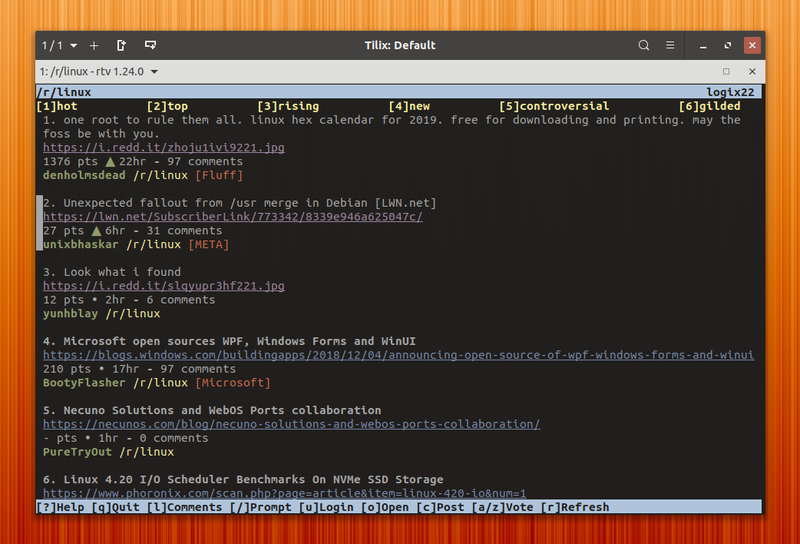 o opens the media in an external tool (if configured), and links in your default browser. You can see all the available keyboard shortcuts by pressing ?.